Coloring: Black (bull), brown to red-brown (cow); sometimes with brown "saddle"
Domesticated from the plains aurochs, this is a very young breed, hardly known outside the Moridan peoples and not yet distinguished with a particular name. They have the advantage of being large, hardy, and highly self-sufficient, including defending themselves from predators; they are by far the largest animal the nomads keep for meat, and the cows give more milk than any other stock save horses. On the other hand, plains cattle are also independent-minded, obstinate, and sometimes downright aggressive, and cause more injuries among their herders than all of the nomads' other livestock combined. More docile individuals are highly valued by breeders, while belligerent cattle may be sold to Kothinar for their performance sports. These goats produce fine wool used for ropes, undergarments, and quality clothing. They are not notable as a dairy breed, yielding modest amounts of milk in spring only. These goats are primarily kept for dairy production. These sheep produce a long, coarse wool used for felting and outerwear, and a finer undercoat used for ordinary garments. Ewes produce moderate quantities of milk. That is interesting. I don't think pigs are well-suited to nomadism — I've never run across them in any of the nomad cultures I've read about — but we can definitely fit these in somewhere. Maybe Vishaza, or Kothinar; could also go somewhere later. I read an interesting thing about hogs in early Manhattan here, which might be particularly relevant to low-class Asar. I'm planning on Okudan having mostly sheep and goats. 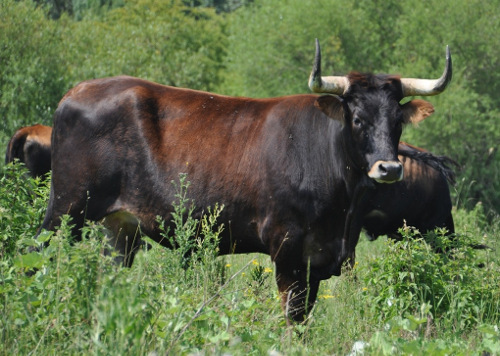 A limited amount of primitive-type cattle, like these, on the idea that the aurochs still exists and the Okudani 'recently' domesticated them. Hadn't gotten as far as breeds of the other livestock yet. Been trying to finish up the actual city. I'm not sure about them in nomadism either, but it was interesting to find their fur is felted rather than spun, it made them distinctly Okudani in my mind. But you're right, it may, too, be a topic of the Asar. Small scale felting there or…? It is a very fun idea that each family might have any number of pigs roaming the streets, branded or otherwise marked as their own. A family sigil might add a sense of refinement… on letters, clothing, shops, and pigs! There's a comment on that page you linked which describes spinning wool from the Lincolnshire Curly, which was itself crossbred with the Hungarian breed. So spinning could be done. Maybe it could be mixed with ramie, which seems to benefit from blending. Ramie is mildew-resistant, which would be appropriate for the Asar. The plant's not frost-tolerant, but it could be something else they brought along.